Color is the means of my idiom. It's autonomic. 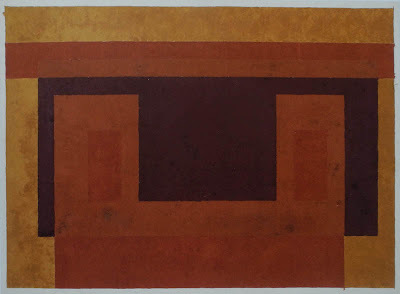 I'm not paying 'homage to the square'. It's only the dish I serve my craziness about color in. 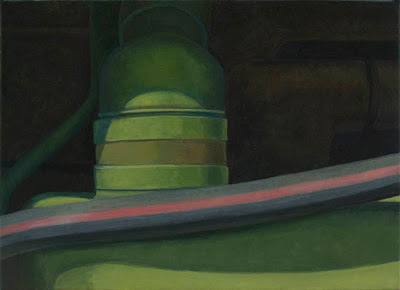 Almost Four (Color Study), 1936; oil on masonite, 13 1/2 x 15 1/4 in. Even in this early study we can see Albers' quirky and rich color sense. There is humor in the "almost" four (there's an oval missing), and in the tiny blue dots anchoring the lighter yellow. Color Study for a Variant/Adobe, n.d.; oil on blotting paper, 19 x 24 in. Albers and his wife Anni Albers moved to America in 1933 to teach at Black Mountain College. They first visited Mexico in 1935, and returned many times over the next 30 years. Josef Albers found there an intensity of color and light that was a tremendous influence on the way he saw color, and the forms of the architecture inspired a series of Adobe paintings. Variant/Adobe, 1947; oil on blotting paper mounted on paper board, 17 1/4 x 24 in. What interests me most now is how colors change one another according the the proportions and quantities [I use]...I'm especially proud when [I can make] colors lose their identity and become unrecognizable. Greens become blue, neutral grays become red violets and so on. Dark colors become light and vice versa. Color Study for Homage to the Square, n.d.; oil on blotting paper with varnish, 13 x 7 in. 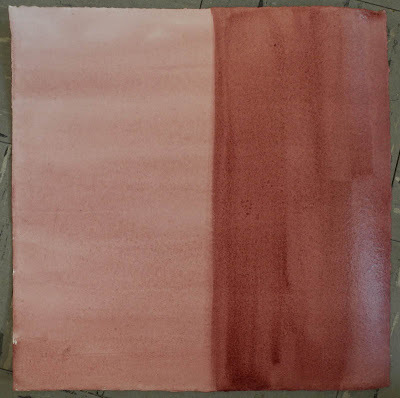 I can get the gloomiest gray to dance,...I love to make a very poor color rich, to let the adjacent colors make it beautiful. 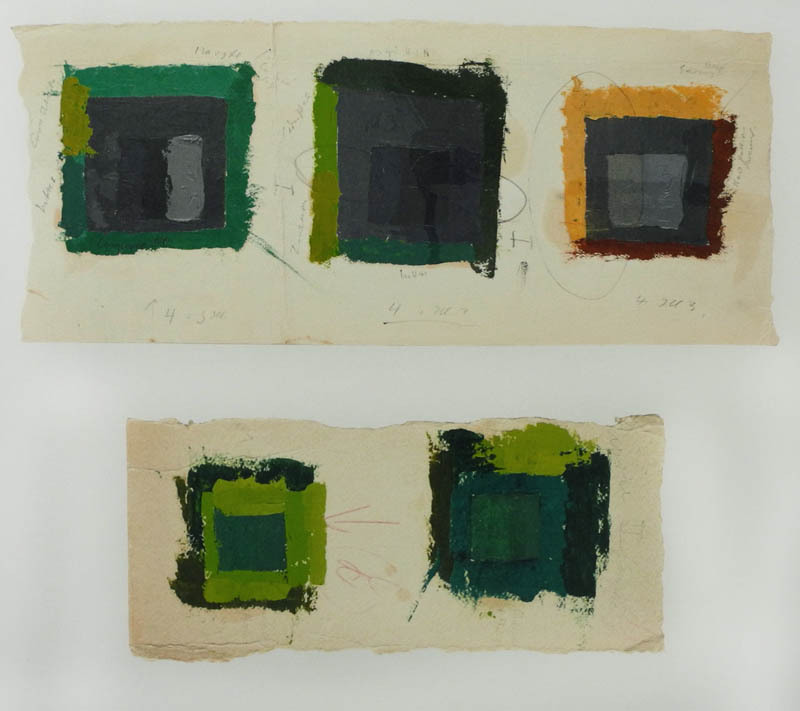 There are so many beautiful color thoughts in these simple studies. 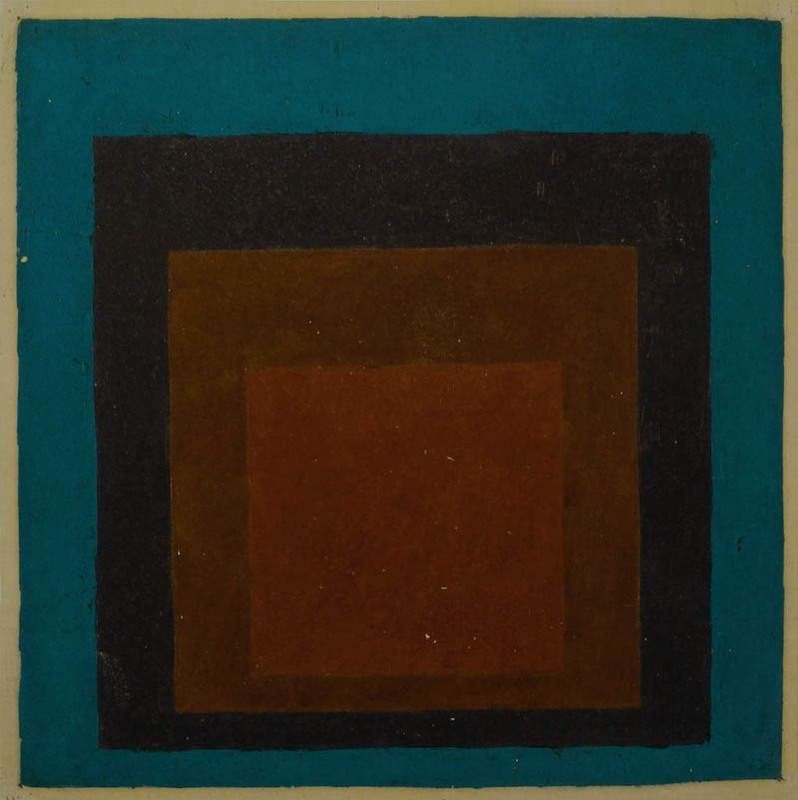 The dark, warm reds of Night Shades play wonderfully against the surrounding deep turquoise. This catalog is going to be a great resource for me in the studio, inspiring a lot of new ideas. I should point out that these photos are photos of photos, and so several times removed from the original work. As I tried to adjust the color to bring it as close as possible to the printed image, I kept adjusting the Hue/Saturation sliders in Photoshop, which in itself was a strong lesson in seeing color. 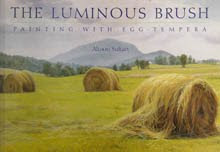 I thought back to my student years, and one summer at Skowhegan, where Gabriel Laderman was always exclaiming "Hue! Value! Intensity!". Color Study for Homage to the Square, n.d.; oil on blotting paper with varnish, 13 1/4 x 12 in. 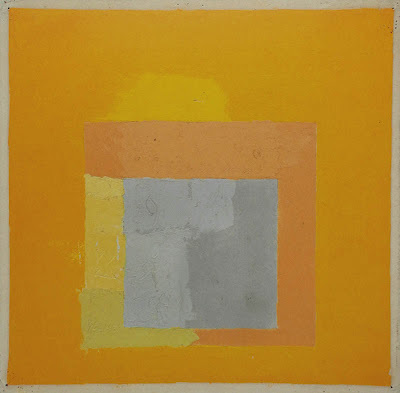 On this work, as on several others, Albers painted a stripe of varnish over the color, to see what affect it would have. 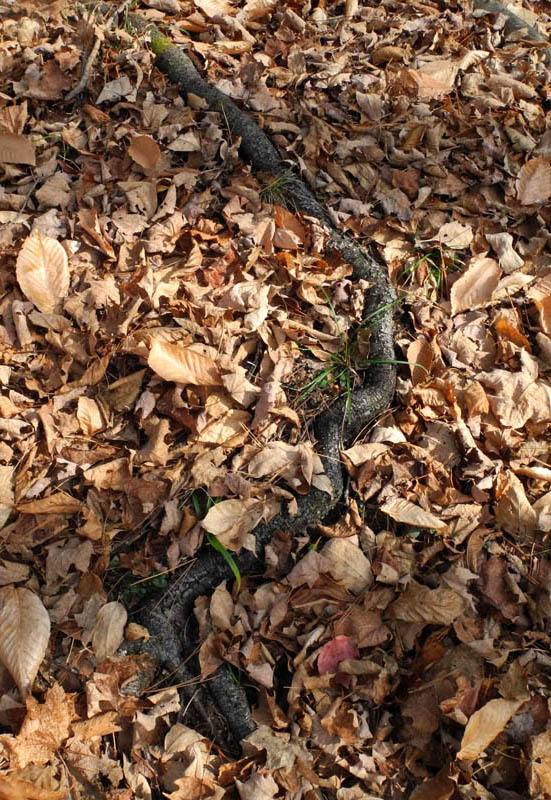 4 1/2 x 9 3/8 in. 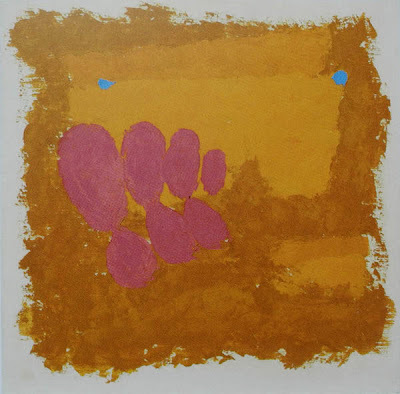 Some of the works were small, quick explorations of color relationships. 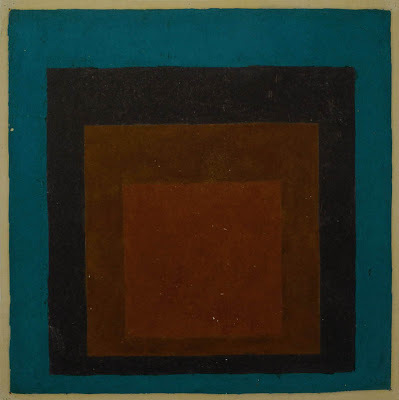 A fascinating aspect of Albers painting practice was that he never mixed colors; he used color straight from the tube, except for pink and purple, which he mixed. He sampled many different brands of the same hue, writing copious notes on the studies, and in that way, had complete control over the color relationships. I try to create the silence of an icon. That's what I'm after: the meditative icons of the 20th century. 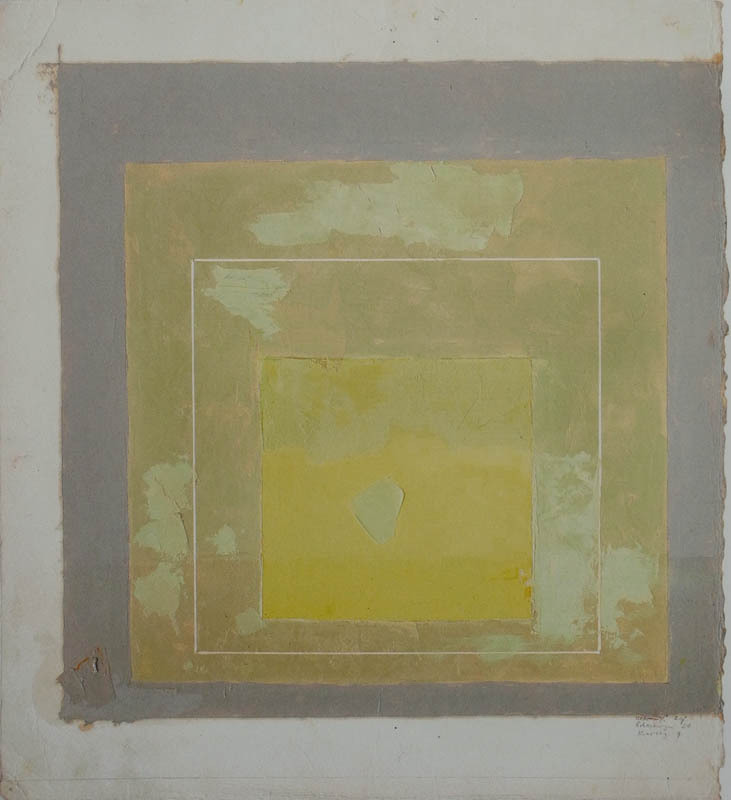 Color Study for Homage to the Square, Platinum, n.d.; oil on blotting paper, 11 1/2 x 11 1/2 in. While I was color-adjusting this image, I was admiring the way the central grays reacted with the yellows and oranges around them, how the gray moved in and out, making the edge vibrant. 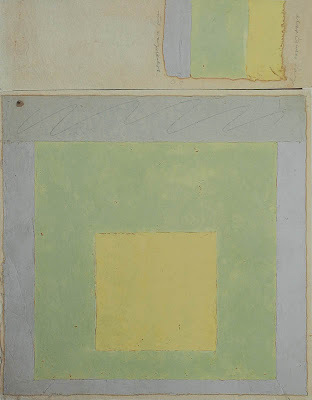 Study for Homage to the Square with Color Study, n.d.; oil on blotting paper, 11 3/8 x 11 3/8 in. blotting paper, 13 1/2 x 12 in. I think art parallels life. 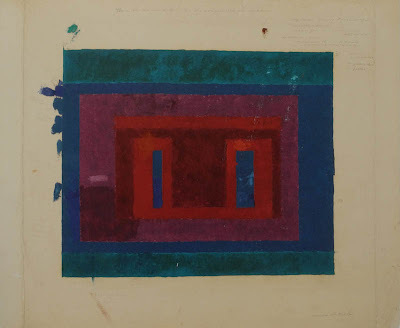 Color, in my opinion, behaves like a man...in two distinct ways: first is self-realization and then in the realization of the relationship with others. In my paintings I have tried to make two polarities meet––independence and interdependence, as, for instance in Pompeian art. There's a certain red the Pompeians used that speaks in both these ways, first, in its relation to other colors around it, and then, as it appears alone, keeping its own face. In other words, one must combine both, being an individual and being a member of society....And from all this, you may conclude that I consider ethics and aesthetics as one. 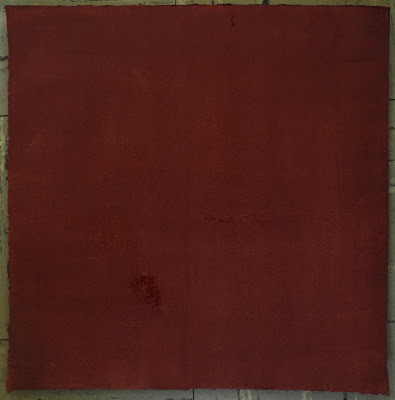 A New Painting: "Red Stripe"
Red Stripe, egg tempera on calfskin parchment, 5 3/4 x 7 1/2 in. Is it possible for a painting of inert machine parts to call up emotions? 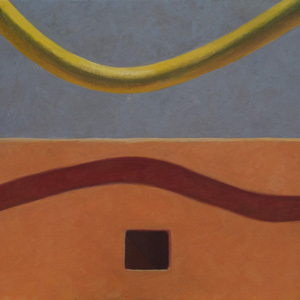 It would seem that my paintings are essentially formal arrangements of color, shape, and light in a shallow space, though of course I always hope that they bring up associations, moods, ideas other than intellectual. My emotions have been very close to the surface recently, and probably because of that, working on this painting created more powerful feelings than usual for me: I sensed that I was painting a self portrait in the large green vertical cylinder. 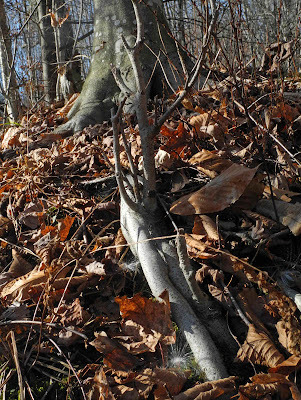 It was stalwart, upright, fully rounded, but only partly emerging from a darkness that could claim it again. The darkness is rich and beautiful, but it is the light that brings life. I awoke yesterday to a pink sky and white ground, and howling wind. 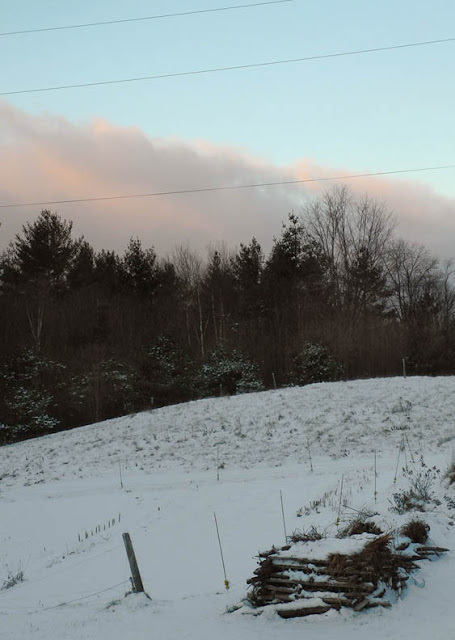 November is usually the grayest month of the year here in northern Vermont, but this year it had been sunny and mild until yesterday. 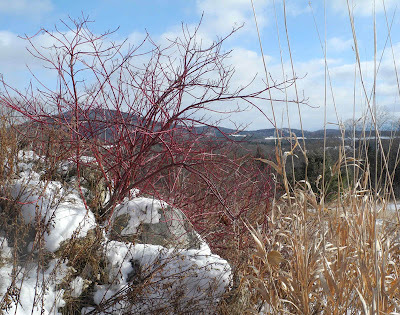 The snow had fallen, but the sun also shone, brightening the dried grasses and the deep carmine of red osier dogwood. Snow, heaped on stone walls, made a greater drama of boulders. Snow, like a dollop of whipped cream, made dried hydrangeas festive. I did not cut back my perennial border, so a benefit of laziness: seeing serried ranks of crisp golden leaves against the white backdrop. 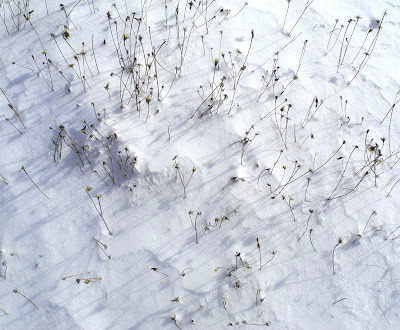 The winter, with its snow and ice, is not an evil to be corrected. 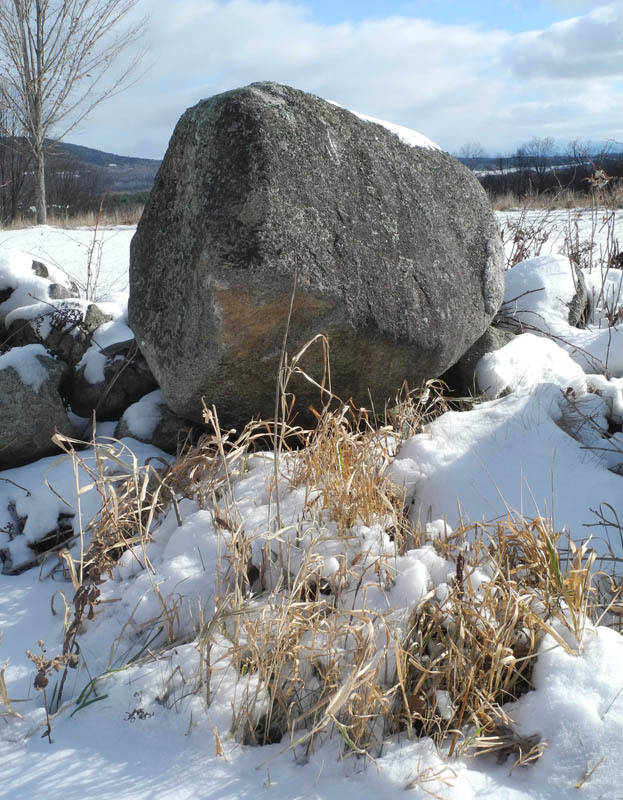 It is as it was designed and made to be, for the artist has had leisure to add beauty to use. ....To perceive freshly, with fresh senses, is to be inspired. 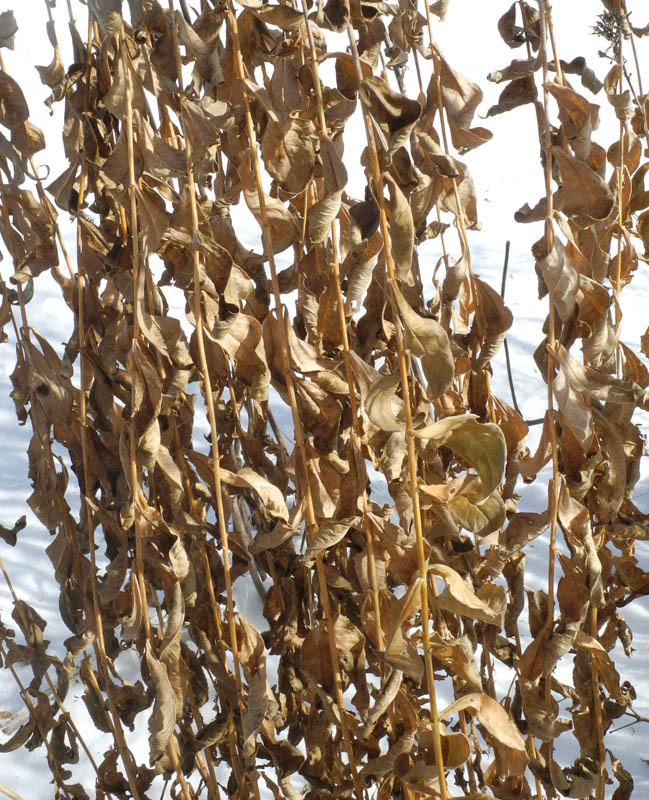 Great winter itself looked like a precious gem, reflecting rainbow colors from one angle. 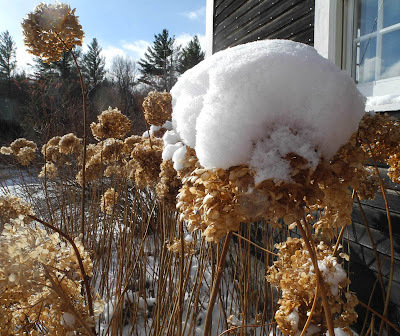 a big ball of snow! 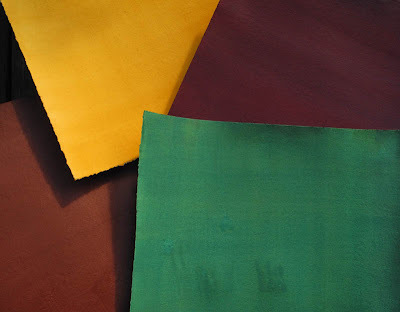 With a hand-toned paper, using pigments and a glue size such as gelatin, we can have the most beautiful range of hue and value as background for painting or drawing. The irregularities of color and finish add character to the paper, just as hand dyed wool is more interesting than wool that is commercially vat dyed. 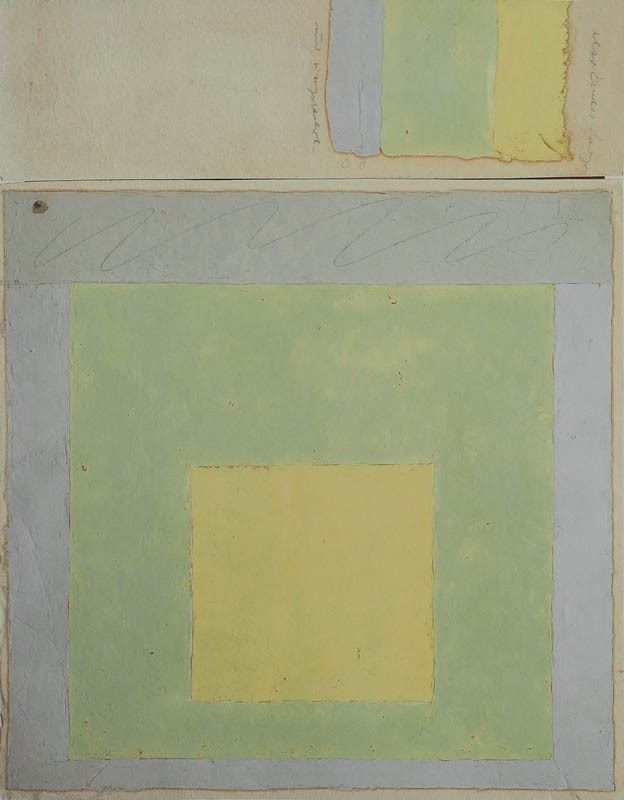 I have a drawing project in mind (more on that soon) for these intensely colored papers. 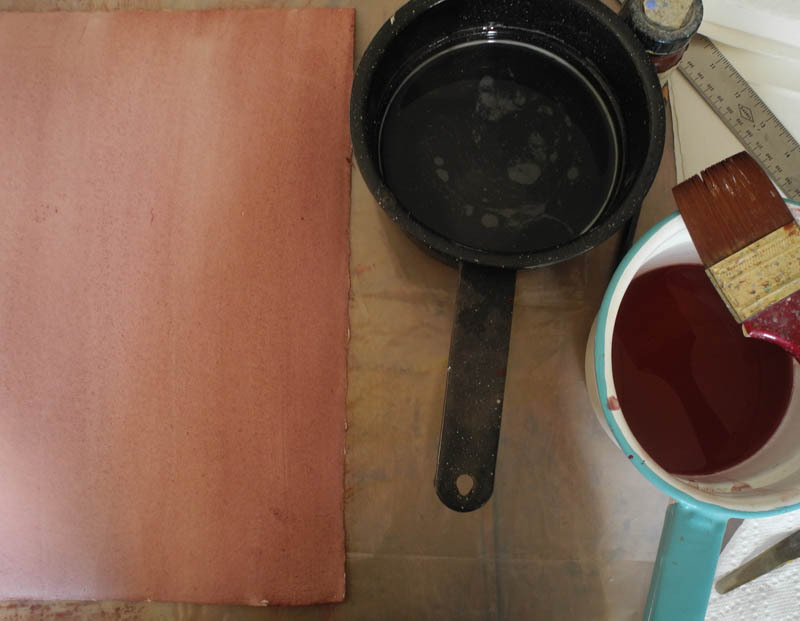 I will be using egg tempera, but I've used ink and gouache in the past. 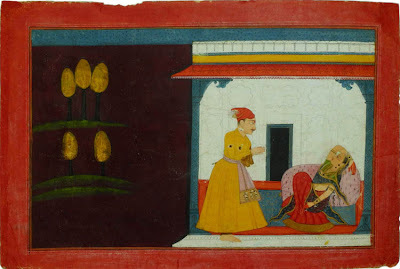 I was thinking of Indian miniature painting while making these, and though I wasn't trying to copy their colors, they influenced me a great deal. 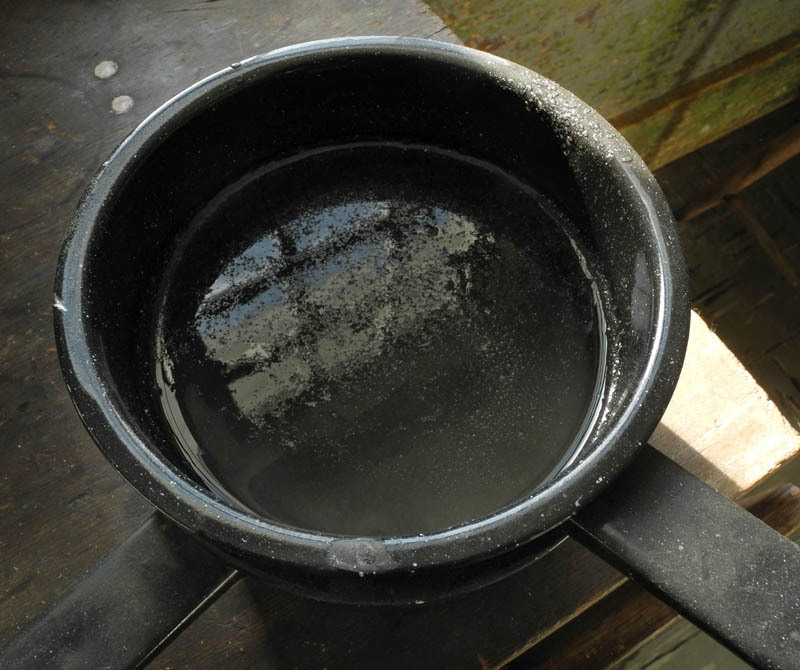 A glue is mixed with the pigment in order to fix it to the paper. I use ordinary food-grade gelatin, available in any supermarket. A small box of Knox gelatin contains 4 paper packets, each 1/4 oz. For this project I dissolve 1/2 oz gelatin, which is two little packets, in 18 ounces of water. So that it dissolves completely evenly, I heat the mixture gently over steam in a double boiler. It's useful to have some steam handy if the gelatin/pigment mixture starts to congeal, as it did several times during my work session. I just put the mixture over steam for a few moments and it liquified again. You don't want it steaming hot though. My small enamel dye pots are perfect for this project, since I don't want to use anything that would later have food in it, which would not be a good idea. 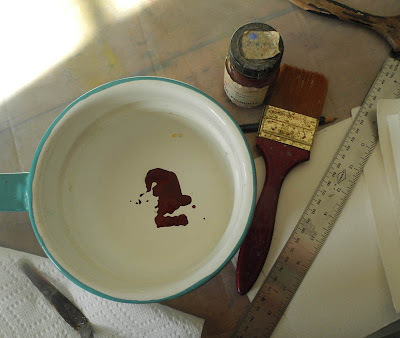 I put some pigment paste, here Caput Mortuum, into the pot; you can also use powdered pigments. I get all my pigments from a great supplier, Kremer Pigments; they have a store in NYC and also an online store here. 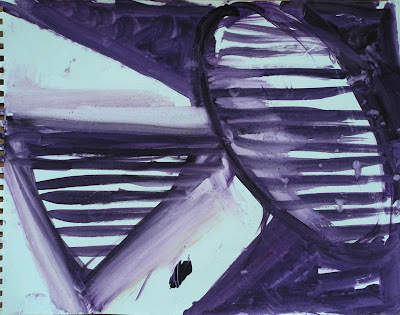 For brushing the color onto the paper I have a couple of soft, synthetic hair 2 inch brushes. You can mix any color you'd like, dark or light in value. Many people like subtle grays, or light tones, which also look beautiful. I add enough of the dissolved gelatin to make a fairly liquid paint, since it's easier to get an even tone with several thin layers than one or two thick ones. This is the paper with one layer of color. And here it is with one and a half. I used some gorgeous handmade watercolor paper, with a rough surface, by Twinrocker, which I've had in my flat files for years. 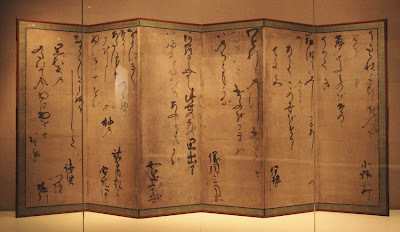 The paper curves while it's wet, but flattens quite well once it is dry, so there's no need to stretch it; that way you can paint clear to the edge, with no white border. 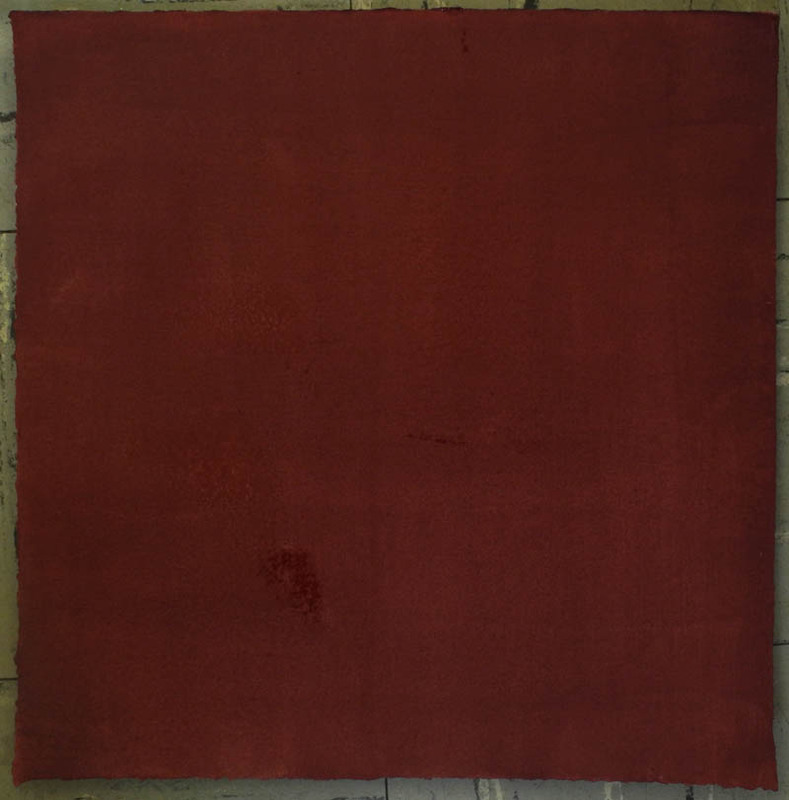 Here is one of my finished sheets, 15 inches square, made by painting 5 or 6 layers of the pigment/size mixture. 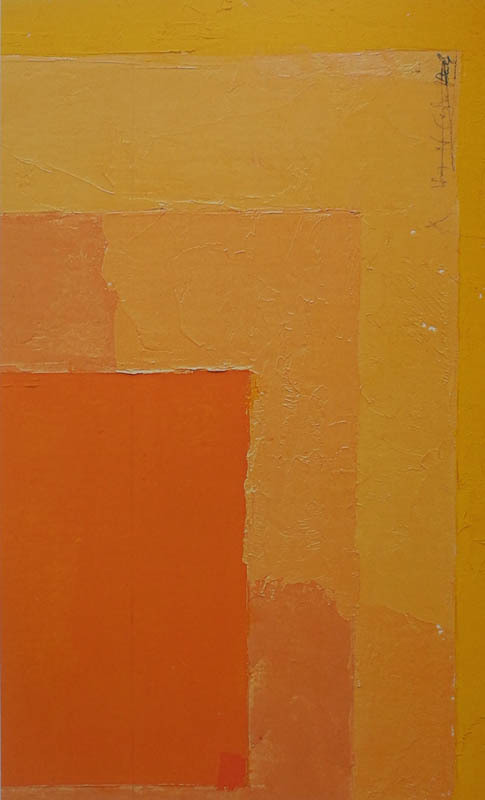 Its imperfections and variations breathe life and air into the color, and make it a very enticing surface to work on. Although this image is contained within the rectangle of the cardboard plate, the print appears to be of free floating shapes. 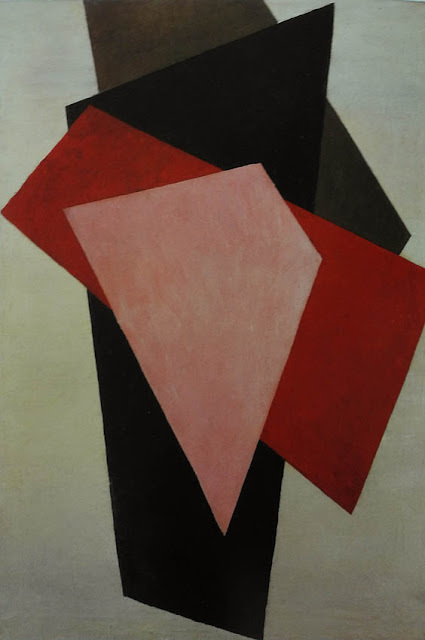 Liubov Popova, Pictorial Architectonic, 1916-17; oil on canvas, 41 1/2 x 27 3/4 in. 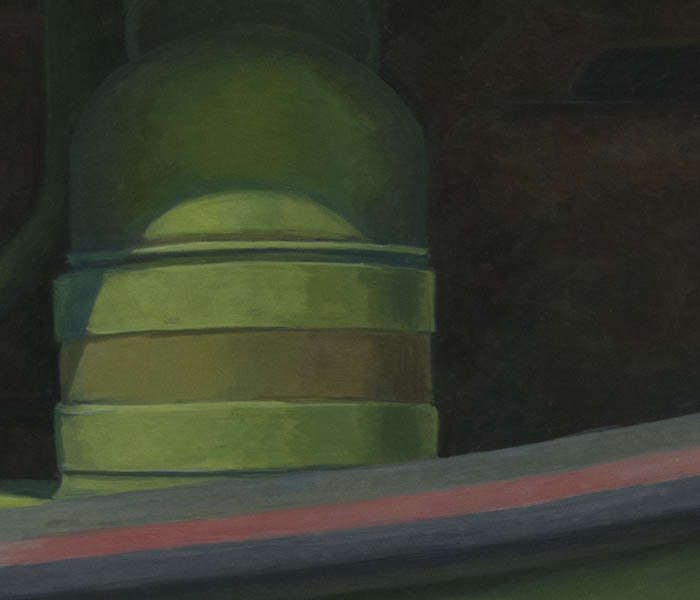 ...an artist I greatly admire, who I wrote about in this blog post. 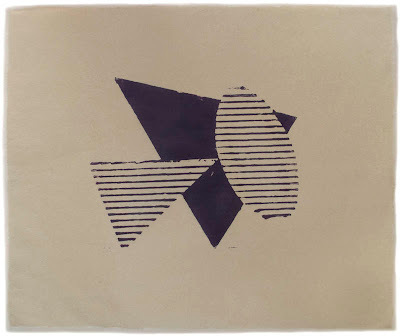 Looking at her work allowed me to free myself from the confines of the rectangle and think about overlapping shapes, think about shaking loose from an expected format. Calligraphy by Hon'ami Koetsu, Poem by Kiyowara no Fukayabu; early 17th century; poem card mounted as a hanging scroll, ink on paper with mica. "That's life: nothing lasts forever." Calligraphy by Hon'ami Koetsu; section of a poem scroll; shortly after 1615; fragment of a hand scroll mounted as a hanging scroll; ink, silver, and gold on paper. Konoe Nobutada, Poetry Screen: Six Poems by Women Poets; early 17th century; ink on paper. Ogata Kenzan, Ceramic Tiles with Poems by the Thirty-six Immortal Poets; early 18th century; glazed stoneware with enamels. 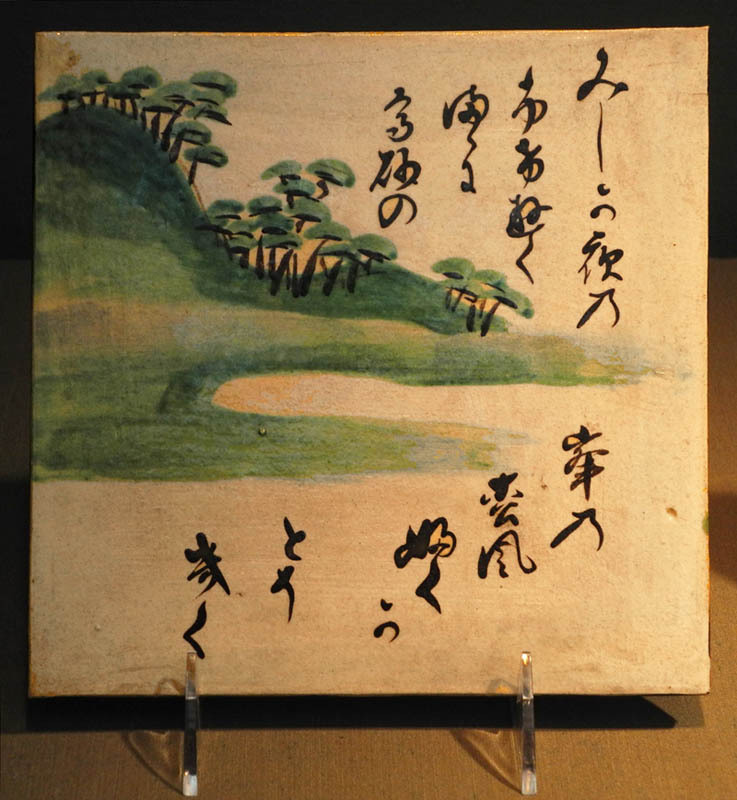 Lastly from the Japanese show, this charming tile, with its little flat-topped trees, looking like so many toadstools, enlivened by the flowing script. 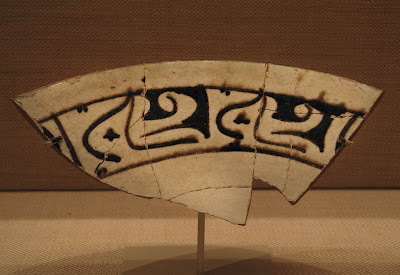 Fragment with Arabic Inscription, Iran, late 9th century; earthenware, white slip with black slip decoration under transparent glaze. 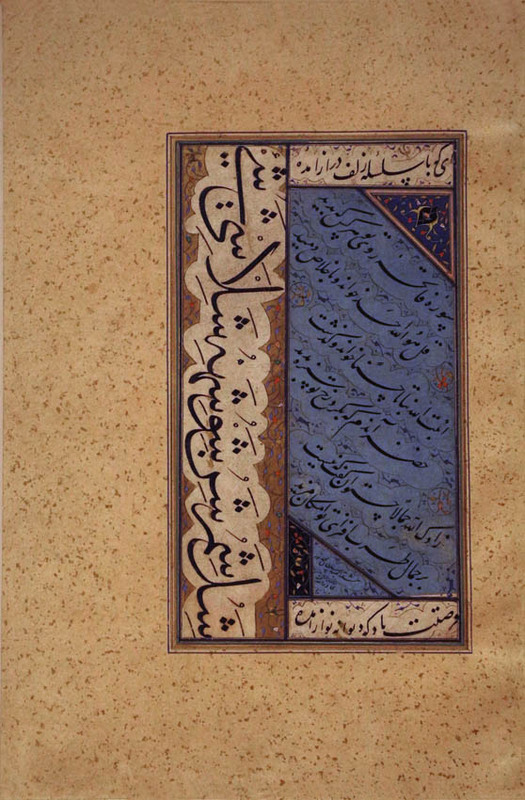 The quality of Islamic calligraphy is much more formal and decorative than the Japanese, and every bit as exciting for me. 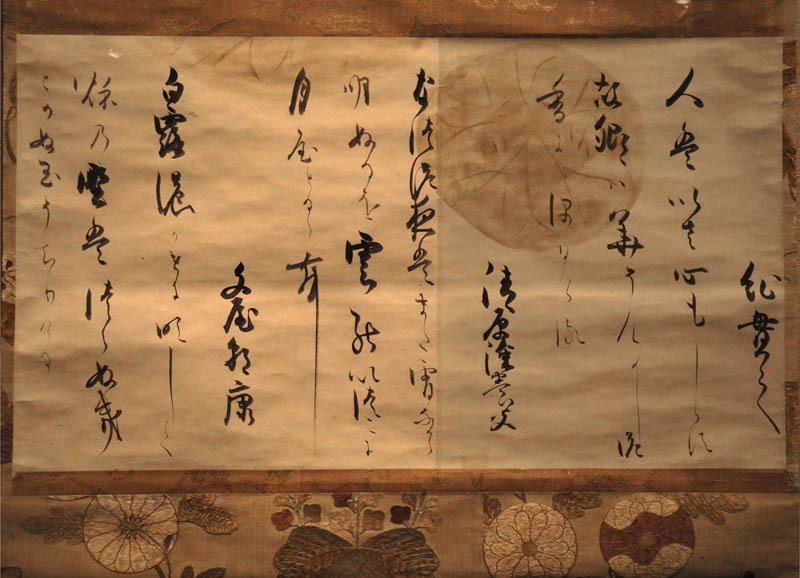 I love the drama of the simple design. 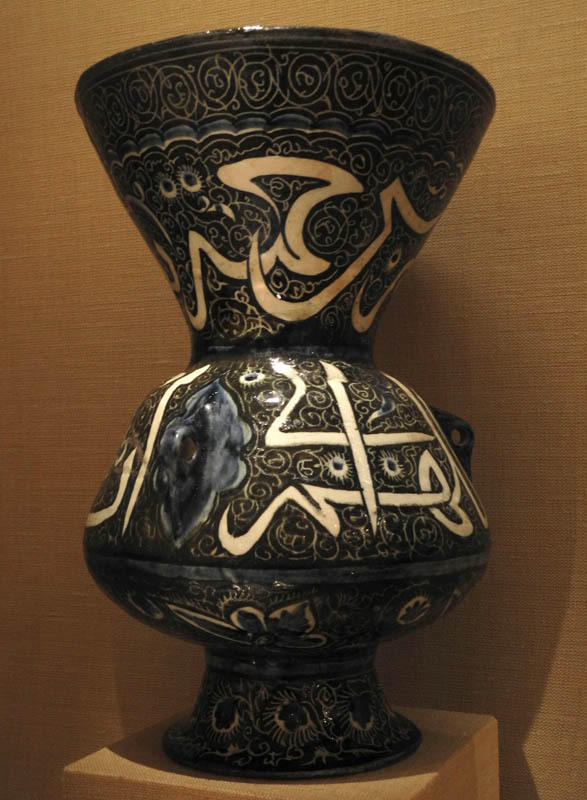 Ceramic Mosque Lamp, Egypt, 15th century; stonepaste, polychrome painted under transparent glaze. 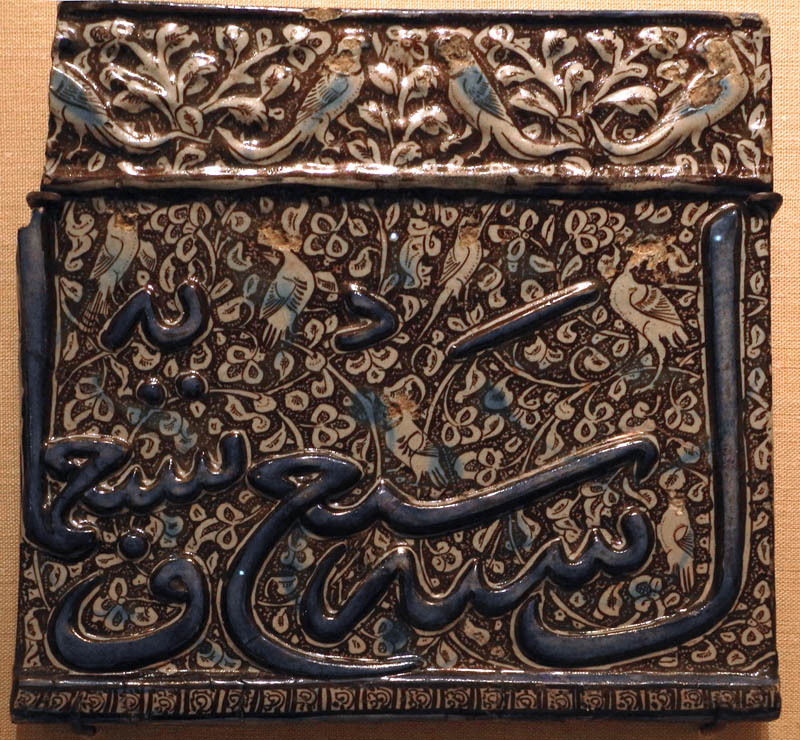 There is an extravagant grace in this calligraphy. 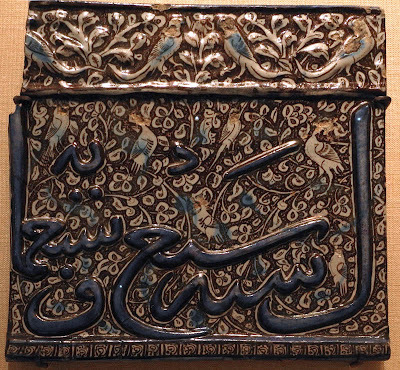 Tile from an Inscriptional Frieze, Iran, A.D. 1333-34; stonepaste, modeled, inglaze-painted in blue, luster-painted on opaque white glaze. 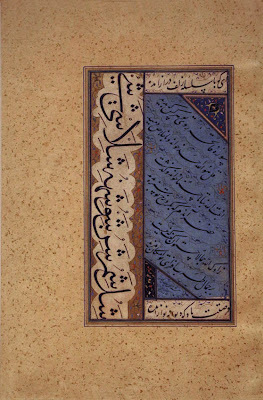 Here the flowing lines of script are echoed by the arabesques of foliage. Page of Calligraphy from an Anthology of Poetry by Sa'di an Hafiz; calligrapher: Sultan 'Ali Mashhadi; present day Afghanistan, late 15th century; ink, opaque watercolor, and gold on paper. 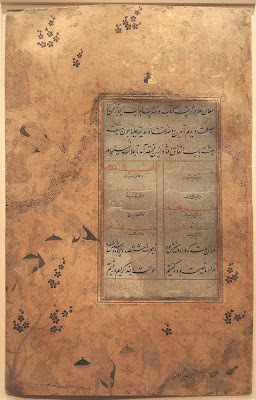 Leaf of Calligraphy; calligrapher Sultan Muhammad Nur; Iran, early 16th century; ink, opaque watercolor, and gold on paper. 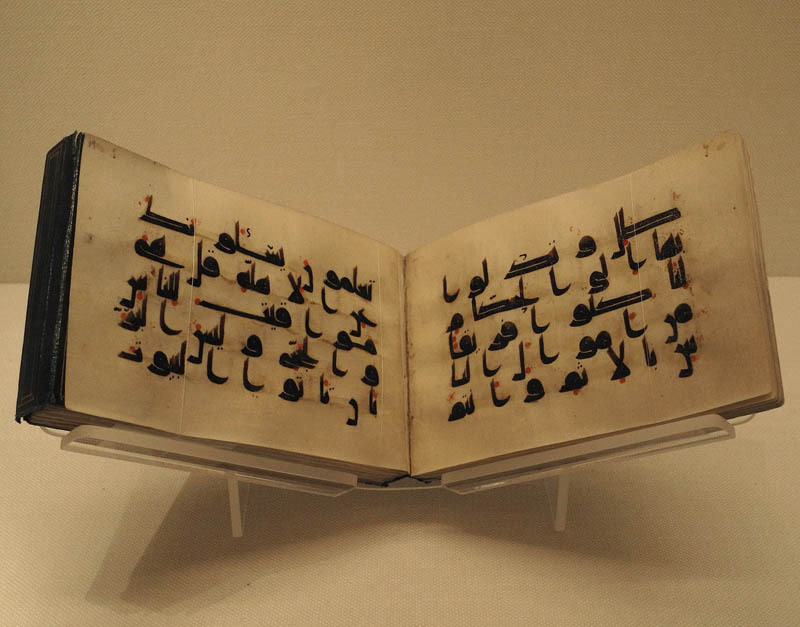 This Arabic calligraphy has a fluid, yet controlled form that seems to me to be closer to medieval European manuscripts in its flavor than to the Japanese form. 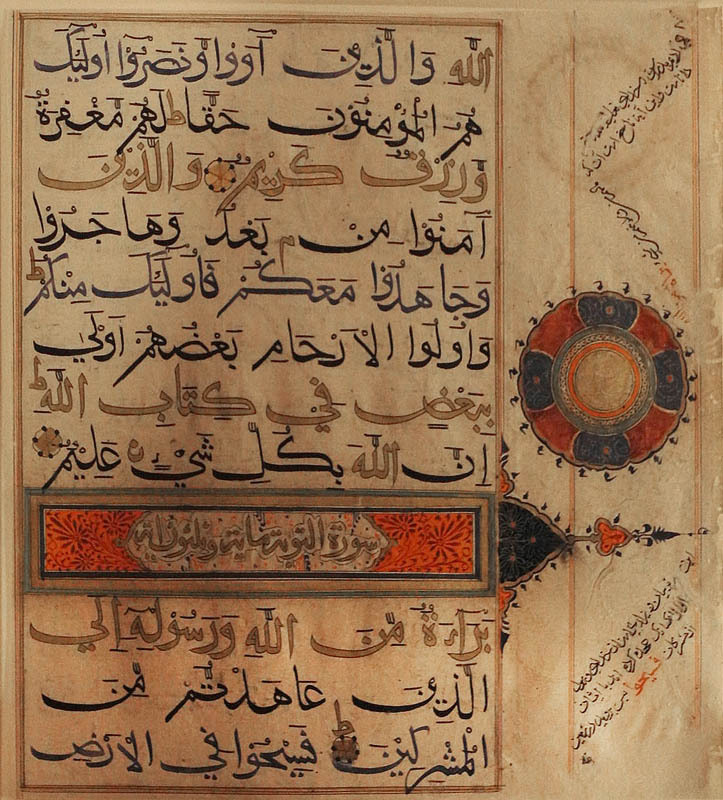 Folio from a Qur'an Manuscript; Syria, second half of 8th century; ink opaque watercolor, and gold on parchment. Folio from a Qur'an Manuscript; India, early 15th century; ink, opaque watercolor, and gold on paper. 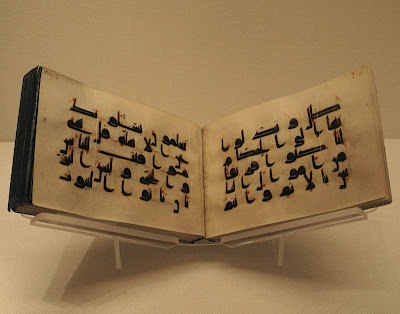 The very early Qur'an above, with its thick elongated letters, is very different from the more cursive script, called Bihari, in the later one from India. Looking at these reminds me of the many fonts that designers have come up with in the 20th and now 21st centuries, how never-endingly inventive artists can be with the simple material of 26 letters in the alphabet. 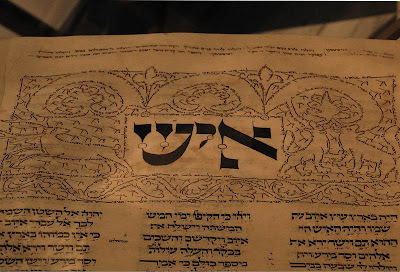 Hebrew Bible; Germany, about 1300; ink on parchment. The imagery on the front page of this bible is made up of tiny words, taken from the masorah, "a system of notes developed by medieval scribes and scholars to ensure the correct transmission of the Hebrew Bible"(from the wall label). The label also points out that this "micrography" is related to the Islamic calligraphic tradition, another instance of the closeness of these two cultures. 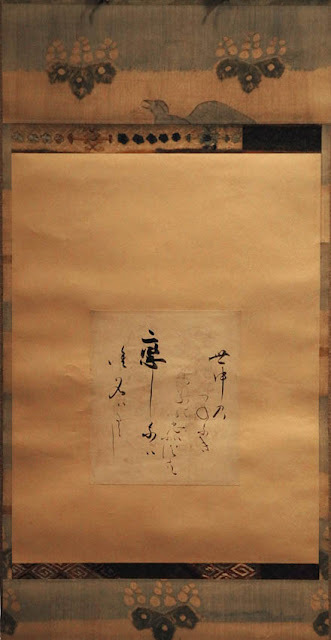 Words as instruction, words as enlightenment, words as emotion, all enhanced by words as aesthetic forms. On woodland paths, far from their originating trunks, the roots of trees meander above the ground, seeking out nourishment. 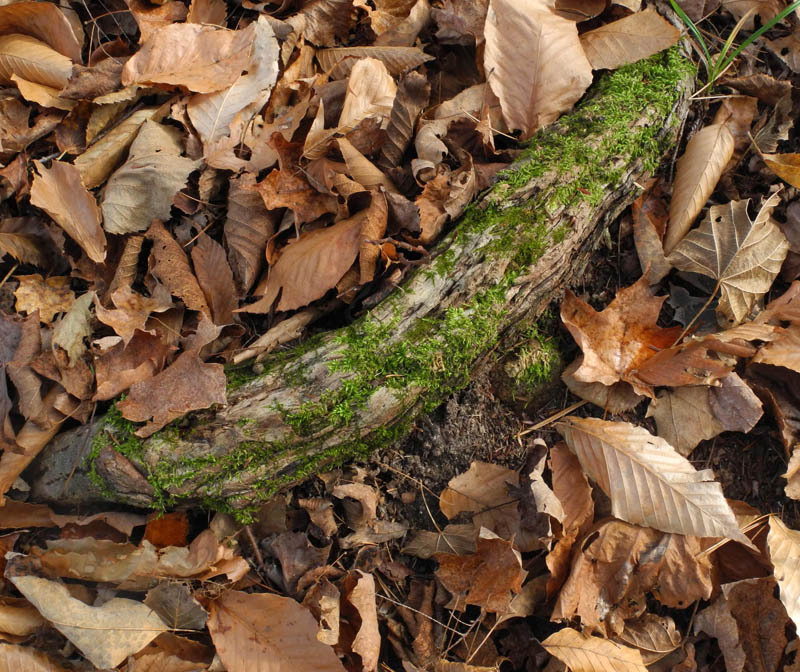 At this time of year, with fallen leaves covering them, I must be careful where I put my feet so as not to trip over them; sometimes a root will rise many feet from a tree, giving no hint of its presence. 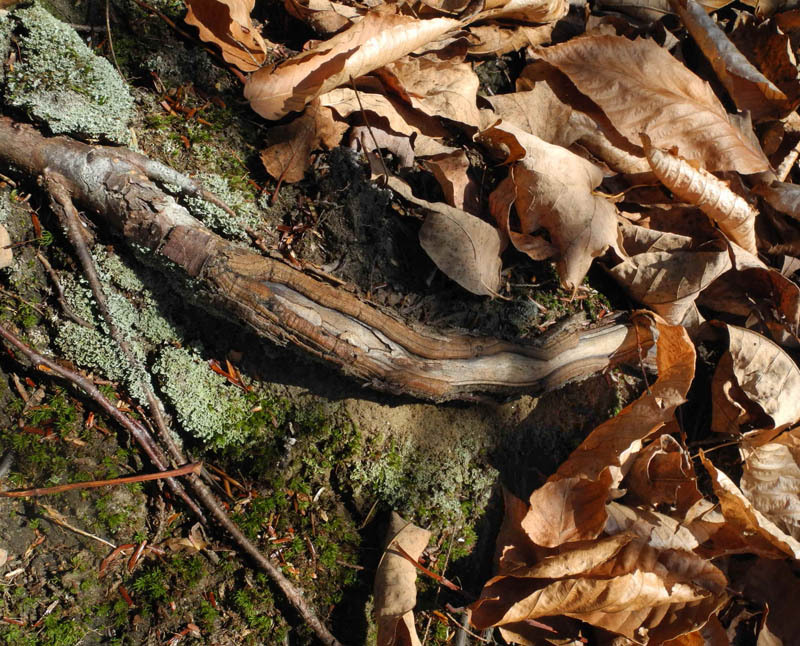 or as a home for mosses. Sometimes erosion reveals roots normally left hidden, showing complex structures, thick and thin. 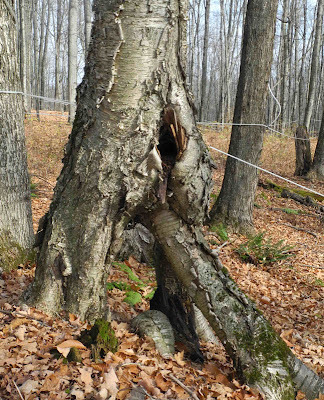 What most surprises me is how some trees seem to have legs, ready to stride away, as their trunks split or their roots appear above the eroded soil. 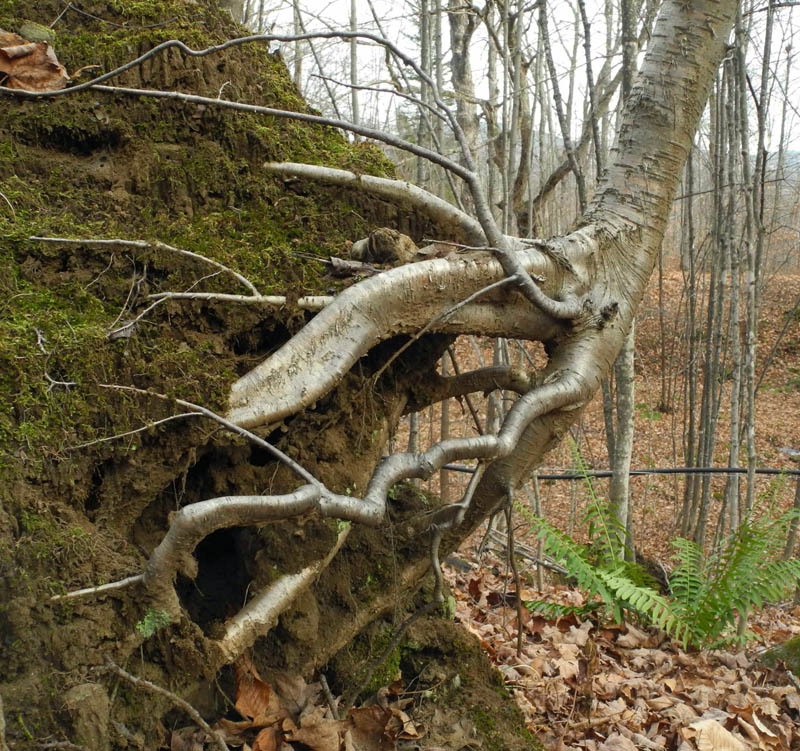 This young birch bravely grew on a mound of earth, the root ball of a fallen tree. 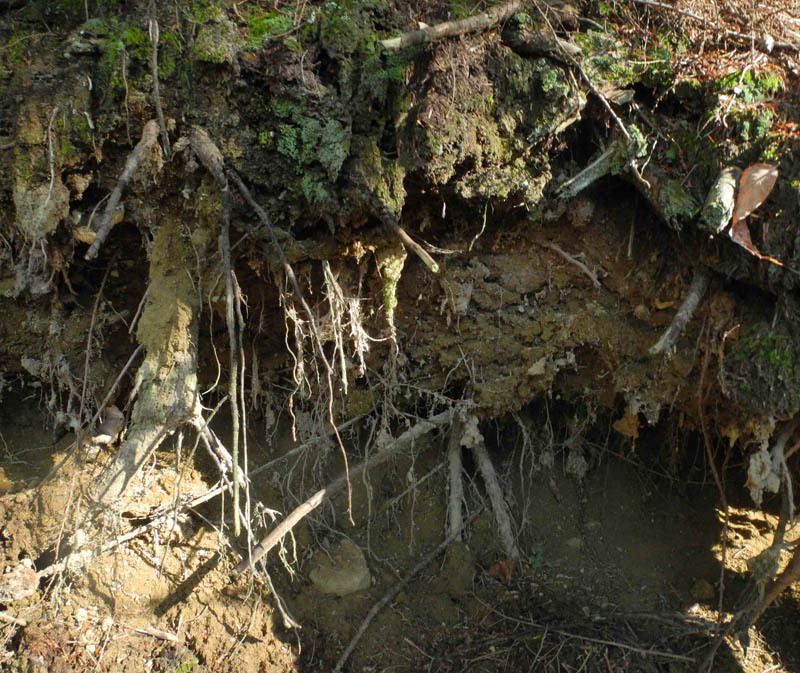 As the soil was washed away, these expressive roots have been exposed, a testament to life's tenacity. As another illustration of the persistence of life, new branches rise from this root of a beech tree, a burst of invention waiting for the rebirth of spring. A New Textile: "Blue Circles"